University of Kentucky Police Communications Officers Heather Terrell (left) and Kortnie Osbourne at work in the UK Police Department. Photo by Jesica Lopez-Huskey. 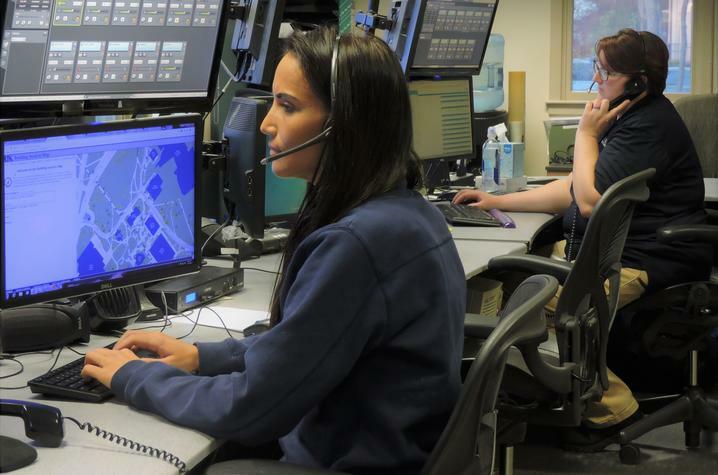 LEXINGTON, Ky. (April 15, 2019) — Every call placed and every LiveSafe tip sent to the University of Kentucky Police Department (UKPD) is answered by one of 12 communications officers. The literal first responders of the department are proficient listeners, adept human lie detectors and expert multitaskers. Without them, police officers would be unable to perform the functions of public safety. Since 1981, the second week of April is designated as National Public Safety Telecommunicators Week. This year, the week falls on Sunday, April 14, through Saturday, April 20. The campaign encourages all to share small gestures or words of appreciation for the critical work that telecommunications officers provide to their communities. For more information about National Public Safety Telecommunicators Week, visit www.npstw.org/.